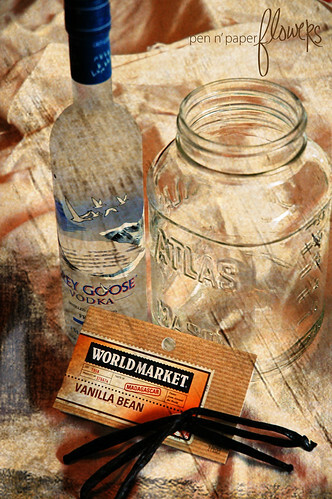 that's right...get a head-start on your holiday gift-giving by making some homemade vanilla. i stumbled across the idea a few weeks ago and i've been itchin' to do it. it takes two months to "cure" so if you do it this weekend it'll be "perfect" for christmas. i've already done mine. today. ten minutes ago. it took less than 5 minutes and...well...that's it. now all i have to do is order some cute bottles (maybe from here) and then print off the labels. the recipe calls for 1 cup of vodka. i personally want to keep some for myself, (not the vodka people...come on)... AND give as gifts. if you'd like to do the same, i suggest tripling the recipe?